According to data uncovered by Swedish investigative writer Janne Larsson, suicides are strongly correlated with psychiatric drug treatment and antidepressants. More than 80 per cent of suicides reported in Sweden in 2006 were committed by persons under psychiatric drug treatment and well over 50 per cent had taken antidepressant drugs. A recently enacted Swedish law requires health care providers to report suicides committed by persons in health care and up to four weeks after cessation of treatment. The reports are sent to the National Board of Health for investigation. In 2006, 367 suicides were reported. Data obtained through Freedom of Information requests show that better than 80 per cent of the persons who committed suicide had been treated with psychiatric drugs. In more than 50 per cent of the cases the person had taken antidepressants. The percentage increased to 60 per cent considering both antidepressants and neuroleptic, also called antipsychotic, drugs. 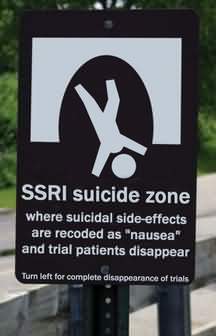 Are suicides in drug trials a "trade secret"? Image: AHRP. Were it not for transparency legislation allowing the public to obtain copies of official documents, these figures would never have seen the light of day, according to Janne Larsson. The health authorities and specifically their psychiatric officials at the National Board of Health and Welfare would have been content to just file the reports. A senior official justified the agency's inaction saying that "evidence based treatment of the underlying psychiatric disorder can reduce the risk for suicide". He was referring to the "protective effect", antidepressant drugs had in his view. Brushing aside the data about a large percentage of persons committing suicide while being treated with psychiatric drugs, the official opined that the data “cannot currently be seen as a representative basis for a discussion about these questions”. A first published analysis of the suicide data does not mention the drug connection at all. The investigation of these cases seems to have been a perfunctory affair: “Every investigated suicide where one can see flaws that can be taken care of, can contribute to the prevention of further suicides”, said the official report. Could it be that Swedish health officials have not heard of numerous studies that connect psychiatric drugs with an increased incidence of suicides? Rather unlikely - perhaps it is their connection to drug makers that colors their view of what constitutes a danger to patients and what doesn't. "I couldn't talk about it because it was proprietary." Health care providers in Sweden are per a new law required to report all suicides committed in health care and up to four weeks after last health care visit. The reports are sent to the National Board of Health and Welfare for investigation. 367 suicides were reported per this law for 2006. Data gotten via FOIA requests show: More than 80 percent of persons committing suicide were “treated” with psychiatric drugs; in well over 50 percent of the cases the persons got antidepressants, in more than 60 neuroleptics or antidepressants. This information has been concealed by senior (psychiatric) officials at the National Board of Health and Welfare. It was contrary to the best interests of Big Pharma and biological psychiatrists. It blew the myths of antidepressants and neuroleptics as suicide protecting drugs to pieces. It would also have hurt the career of many medical journalists to take up this subject; journalists who for years have made their living by writing marketing articles about new antidepressant drugs. So nothing has been written about this in major media in Sweden. Senior officials at the National Board of Health and Welfare have relied on evaluations from well-known Swedish SSRI proponents, (like psychiatrists G. Isaksson, A.L. von Knorring) who for the last decade have touted the new antidepressants as “life saving”. A senior official said that “evidence based treatment of the underlying psychiatric disorder can reduce the risk for suicide”, referring to the “protective effect” that he believed antidepressant drugs had. The data about the large percentage of persons committing suicide, “treated” with psychiatric drugs, were brushed aside by the official, saying the data “cannot currently be seen as a representative source for a discussion about these questions” (!). The agency has recently published its first analysis of cases from 2006, reported per the new law (Suicides 2006, reported per Lex Maria; in Swedish). Not a single word is written about the most compelling fact: Well over 80 percent of persons killing themselves were treated with psychiatric drugs. Instead of using this result to save lives the result was hidden. It was claimed: “Every investigated suicide where one can see flaws that can be taken care of, can contribute to the prevention of further suicides.” Yet no investigation at all was done in the suicide inducing effect of antidepressants and neuroleptics. At regional level at the agency there are definitely officials wanting to do a good job and get at the real facts of the scene. They are however betrayed by top management. For example: The forms ordered to be used at regional level when investigating suicide cases completely omit factors about drug treatment. A certain number of persons killing themselves can be expected to be suffering from drug induced akathisia – an extreme inner restlessness, a feeling of having to creep out of ones skin, a completely unbearable condition. It is created by the psychiatric drugs, not by any “underlying disease”. Akathisia is a condition that can make a person commit violent acts – against self or others. It is a condition officially recognized and taken up in the warning texts for the drugs. A number of persons have been affected by mania or hypomania – again created by the drugs; conditions also officially recognized; conditions that can lead to suicide. Some of the valid questions in an objective investigation would be: Is the suicide an effect of an unbearable condition created by the drugs (like akathisia)? Has the drug dose been increased – with a catastrophic result – when the worsened condition in actual fact was caused by the drug (while being blamed on the “underlying disease”)? Has the patient been subject to an abrupt discontinuation (with severe withdrawal symptoms as the result)? Is the catastrophic result very likely caused by concomitant use of psychiatric drugs? Has the patient been informed about the serious harmful effects that these drugs can cause? None of these questions are part of the form worked out by senior officials at the National Board of Health and Welfare. These questions would – if asked and the answers used – save lives. But they would also threaten the profits of Big Pharma and the careers of their hired psychiatrists. Therefore they cannot be asked. Among a total number of 377 women who committed suicide, 197 (52%) had filled a prescription for antidepressants within 180 days before their death. Another 29 women (8%) had filled a prescription for neuroleptics ("antipsychotics") ONLY within 180 days before the suicide. This means that 60% of the women who committed suicide in Sweden in 2006 had filled a prescription for an antidepressant drugs or neuroleptics within 180 days before committing suicide. So much for psychiatric drugs "preventing suicide". Anyone with emotional trouble is better off staying as far away as possible from psychiatrists and their drugs.